Many people talk about making a difference – but some don’t just talk about it, they do it. And people like these are the ones I met at freshStart. I came to Sedgefield to be a volunteer at Masithandane, a wonderful NGO which serves in Smutsville, the township on the periphery of this town. It was during these three months in South Africa, that I also come across freshStart, an amazing organization which I simply loved. Very often NGOs and NPOs do EITHER – they focus on humanitarian/ social issues OR target environmental problems. The amazing thing about freshStart is that it tackles both. Every Wednesday, more than one ton of recycled waste is transported in a big truck out of Smutsville. That is more than one ton of plastic, glass, tins and paper, which might otherwise be contaminating the streets of Smutsville or would end up in a dump site. At the same time, every Wednesday, the 250 + kids from the community learn “real life lessons” while having the opportunity to get something they might really need or have dreamt of for a long time. They learn to work towards their goals, they learn to save (mula points in this case), and be proud of their achievements, etc. Most importantly, at freshStart, they are given love. I could really see that from the moment the children entered the swop shop, they were treated with respect, dedication and love. This special love, even though it is only for a short time once a week, is giving the children what every human being needs the most. It is so heart warming to see how freshStart has a unique way of helping people through helping the environment. I was part of the environmental committee of the student’s council for three years at my school in Chile. We tried to teach the children to recycle. Everybody knows that putting recycling bins in the classrooms and telling the students to use them, would have no other results than the teachers finding very similar looking mixes of trash in each of the three containers at the end of the day. Basically, if children and young adolescents are to learn to recycle, one has to use creative teaching methods. I have to say, that although we tried very hard to find some of those teaching methods, we never really succeeded in creating good recycling habits among the students. It is not an easy task. Nevertheless, I believe that freshStart, with its swop shop, has found a way to succeed where many others have not. This is why I loved freshStart so much. Not only do they have loving, dedicated, and caring volunteers, but they are also making a big difference to our environment AND the people in the community with this amazing and very innovative initiative. I loved being part of this project for these three months. Being with the kids, taking them by the hand, going with them through the shop, looking for things they wanted to take home and sharing with the other volunteers was a heart warming experience! The Transvaal Voortrekkers held their 25th Sea-camp at Swartvlei Caravan Park in July 2017. There were almost 500 primary school children attending the camp. Each year group does its own learning activities varying from animal life, to sea life, seashore and marshland biospheres. Every year, the Voortrekkers also do a project (or two) as a combined group, working towards helping those less privileged. Amongst others, they had a drive called “‘n Baadjie vir ‘n maatjie” (a jacket for a friend). 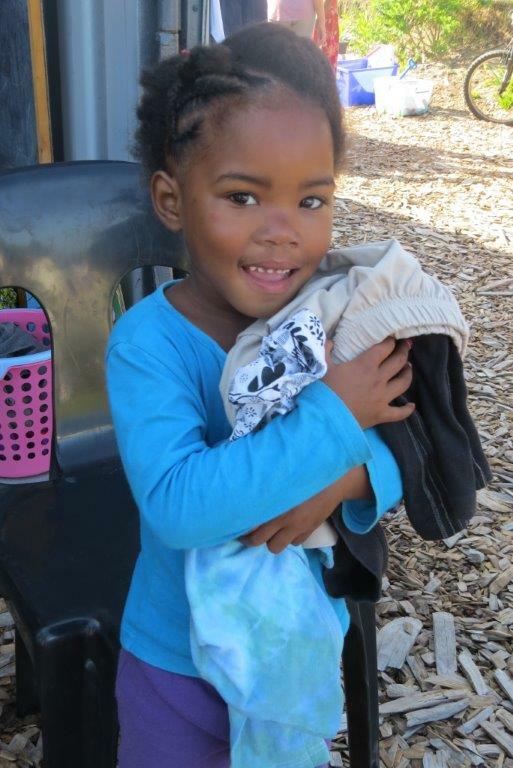 In the words of the camp director, Tekkies Kotze, “The kids went crazy!” and besides jackets, all kinds of clothing and shoes, even curtains and a few blankets and pillows, were carted down from Gauteng and delivered to the freshStart Recycle Swop-Shop’s storage container. As part of their 25th celebrations, the Voortrekkers had a BIG party on Friday (07/07). Two long strips of white cloth (each 128m in length) were staked down the middle between two rows of tents. It took 20 minutes to get 534 children seated in 4 rows beside the “table”. Plates contained an iced cookie, a small box of Smarties, a packet of NikNaks, a lollypop, a “Swartvlei 25” badge and a memorial cup filled with fruit juice. After two short speeches and a prayer, the adults served the children hot dogs and more juice. Popular Afrikaans music was thumping through the loudspeakers and after all had eaten, some of the children danced to the catchy beat. It was to this wonderful party that a group of our Swop-Shop children were invited. “When you have a party, you invite some friends”, and the Voortrekkers wanted to invite local kids to the party.” Not only did the Voortrekkers send one of their busses to collect us in Smutsville, they also entertained our children at the Caravan Park before lunch, presenting them with fleece beanies and a bag full of creative activities. After the meal, the children could enjoy a variety of jumping castles which were scattered across the camp grounds. There were also two machines providing free candy floss! “Our” children could not believe their luck!! After they had been jumping, candy flossing and playing soccer, the kids moved to the far side of the camp ground where there was “wet fun” to be had with the older campers (and their invited friends.) They disappeared in the soap foam on the one side, and then ran, soap suds flying in the wind, to slide down the slip and slides next to it. The sun was going down behind the dune and the campers were called to go and shower. It took us a good half an hour to get all our kids together, changed into dry clothing and each reunited with their shoes and sweaters. Once all were in the bus, we sang our “baie dankie liedjie” (thank you very much song) to those who so generously treated us to an unforgettable day of food and fun. Leticia, is one of our wonderful, young volunteers. This is her story, why she enjoys being a volunteer. Roleese is a tiny girl with a very loud voice. When standing in the line, waiting for her card, she always makes herself heard. One day my sister, Jeanette, asked her, quietly, if she knew another girl’s surname. Roleese declared, turning to the girl, grinning: “Ek weet nie wat’s haar van nie, hoe’s jou van? !” (“I don’t know her surname – so what’s your surname?”) Roleese may have a big mouth, but she’s got a big heart to match. She came and gave me a hug one Wednesday and snuggled onto my lap, announcing that I was her ‘Ma.’ I felt very honoured. Volunteering at freshStart is so, so rewarding. This young man is 12 years old. 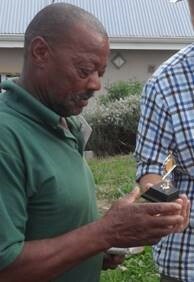 Last year, he attended 11 out of a possible 34 Swop-Shops. This year, he has not yet missed a day! The reason? Probably the fact that he was saving for a bike and wanted to reach that goal ASAP! With 40 points in the “bank” when the year started, he only needed 7 trading days to collect the rest of the points for a total of 200!! On Wednesday, there were giggles and sneers from among his friends when he pushed the PINK bicycle towards the check-out, but Luchiano was not phase! He was buying the bike for his younger sister! He quietly posed for the photo’s – common procedure when a bike finds a new home – and proudly pushed the pink bike home. What does a little sister say to a big brother when he brings you a bicycle?? Canadian Sunyata Choyce is one of our new volunteers who visits freshStart regularly when she is in S.A. Sunyata is also founder director at C.O.L.O.R. International, a Canada based charity. It’s wonderful to find more and more charity based projects taking on this extra much needed basic health care element! I have the blessing of being the SwopShop ‘First Aider’ – seeing to the wounds, cuts and skin infections of the children after they have exchanged their recycled material for treasures in the shop. “This one fell” exclaimed a volunteer, bringing me a 7 year old boy wrapped up in a beautiful warm dressing gown, he had just purchased. Although the sore on his head was the most apparent, the big wounds on his arms and legs were covered with old puss soaked bandages and were clearly infected and ‘stuck’! We sat him down to clean, treat and redress his wounds. He was very brave as he sat with us, knowing we were helping him. Along came a granola bar to keep his mind off his wounds as he was being treated. We gave him extra bandages to take home and suggested he go to the clinic. We told him he had a brave heart as I painted a bright red heart on his face from a donated lipstick. He smiled and went on his way! The children quickly learnt that many ‘hearts’ were being given out. Hearts! Yep…. now the First Aid station also turned into the face painting station!! Why the SwopShop? . … some words and thoughts from one of our wonderful young volunteers, Jeanette Van As. 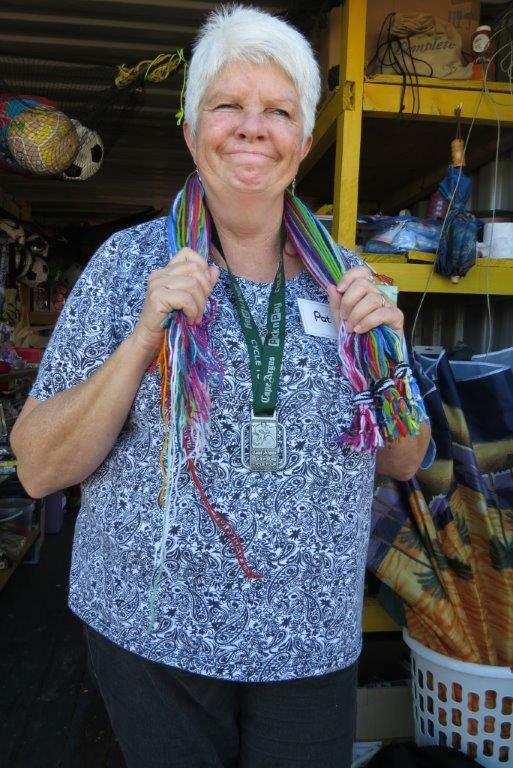 Why would anyone give up three hours of their Monday afternoon, every week, to help at the Swop Shop in Smutsville? In my case, the main reason was, “Because Mom said so.” She wanted us as a family to do some sort of community service, and the Swop Shop seemed the best place for us to volunteer at. “Because Mom said so” was not a good enough reason. So I started telling myself that it was to help others, and to reach out to them, to get to know them. Yet there were still many days I wished I could be somewhere else. Then, sometime early this year (2016), I made the decision! To set a weekly challenge for myself: How many kids can I bless today? From then on, going to the Swop Shop changed. For the better. And NOW – me and our girls . My job at the Swop Shop is to initialise the girls’ cards. After their recyclables / collections have been weighed, I find the card with their name and write down the points they have earned on the day. The best part of this task is when you start to recognise faces, and are able to connect the names with hardly a moments’ hesitation. From then on, it just gets better. You start to learn a little of some of the girls’ stories, and discover a bit of who they are, and they worm themselves very firmly into your heart. There is Lindokuhle, who only speaks Xhosa, yet always smiles to beat the band, and gives me a smacking kiss goodbye at the end of the second term. Then there’s three-year-old Roti, who just wants to be cuddled. (And sit on my lap, – we’re still working on teaching her my name.) Andrea and Newtoné, both dimple when you remark about the whopping number of points they have earned – again! Euanay peeks at you from behind her brother; Emma calls me by name, shares my birthday and loves to buy clothes; and Yanelisa is always thoroughly excited to just be at the SwopShop. Our last Swop Shop of the second term certainly ended on a high note. I went through a flurry of hugs (squeeeeeeeeeeeeezes) and isolated kisses from our dear girls, and told them I would miss them. It is definitely not just a formality, for a week later, ( the 1st week of school holiday ) Monday seemed strangely empty without the prospect of Swop Shop in the afternoon. Let us never forget our fabulous Volunteers. freshStart, being a non-profit organisation, could never function without the commitment and dedication of our precious volunteers and helpers. In May, we presented the first “U Rock the Shop” awards to some of our volunteers who, in some way or other make such a big difference to our Recycle Swop Shop. The first recipient, Rejoice Gawie is like the sun… he has been around since the inception of the SwopShop and he is always there. However, like the sun, he has the uncanny ability to disappear behind the clouds at the most inconvenient times. Then, fortunately when one really needs him, he comes shining through with his disarming smile, knowing ways and buckets of energy and enthusiasm! 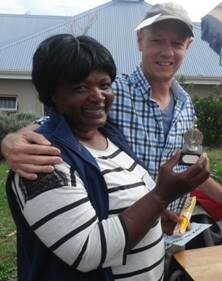 Lindiwe Nyenge came with celebratory ululu-ing to receive her little trophy (also recycled!). 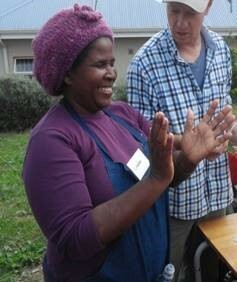 Lindiwe speaks Xhosa and English, as well as Afrikaans, skills highly valued at the Swop Shop. She has recently learned to assist the children with their shopping and is doing a fabulous job. As such she has received a special award for Great Personal Shopper. And then there is Martie Rooi, the First Aid lady of Smutsville, and our 1st Lady. Marti has always been a source of wisdom and help to freshStart. Due to recruitment issues, the Mobile Clinic is for the time being unable to continue with their service to the children at the SwopShop. Martie has stepped in to provide basic health care. With an eagle’s eye, she scans the row of children and calls those with sores, cuts or scabies to her chair where she treats them with first aid medicines donated by Colours International and the Sedgefield Clinic. A record is kept of all the children she sees. For her excellent work, Martie has received an award as our 1st First Aid Lady and as a tremendous role model. There is Irene, who was a super help sorting out the storerooms. Irene also got our blanket-project going and turns up every Wednesday, helping with our setting up and pack up. With German precision, (Irene is an overseas visitor) she notices things that need changing and is great at spotting the children that cough too much – she is like an extra set of eyes and ears around the shop. We have Pat who is willing to do “absolutely anything”. She was the next link in the blanket-project chain; teaching the craft ladies to do the edging and new designs. Pat was also key to sorting out our ineffective system for registering new children, she also made the lovely bunting for the SlowFest (now used at the swop shop), Pat has prepared the supplies for making Mother’s Day cards, and helped sort out the piles of donated fabric. Thank you volunteers, the SwopShop would not exist without you! A quiet, determined little girl, who has not missed one SwopShop this year, Amber-Lee, is a very responsible older sister. She normally brings Marquin, her younger brother, with her unless he is taking his nap. When asked what Marquin should be buying with his points, Amber-Lee would reply: “Klere,” (clothes), but Marquin would run into the shop to touch every last toy on the shelf! Lately, their little sister Raquel has been tagging along. On her first visit she cried sorrowfully. This week, she happily sat down to listen to a story. Half way through Raquel shoved her shopping bag into my hands. I stopped reading, untied the bag and asked her if she wanted to look at her goodies. She silently took out the pair of tiny purple flip-flops, gave them to me and waved her foot in front of my face. I put the first flip-flop on her dirty little foot. It fitted perfectly. Then the other foot and the second flip-flop. She got up and stomped off, trying out her new shoes before plopping down again. Amber-Lee loves to linger at the Kiddies Corner, she is absolutely crazy about colouring in. This Monday (13 June) we had play dough for the younger bunch while many older children were making friendship bracelets. Amber-Lee was absorbed in her play dough, for once able to forget about her younger siblings and enjoy herself. And there was Marquin, spitting out bits of pink play dough while Raquel was licking hers. I took them to the blanket where we sat down to read stories. We’ve now done the shoe routine and almost finished the story, when Marquin announces “Huis toe gaan.” (I want to go home.) I was rather surprised as he enjoys stories. Then he gave one big yawn, and another and yet one more. I called Amber-Lee and asked if Marquin had had his nap. She reluctantly admitted that he hadn’t. I knew she loathed giving up her happy play dough hour, her time to be a 7 year old child. I took her aside and whispered in her ear that I’d like to give her a bit of play dough to take home as she now had to give up her play time to take her siblings home. Into a small white plastic tube I put a ball of red play dough, and this she carefully put into her bag of shopping which also had her reward-bag: a set of coloured pencils, a pack of 4 lead pencils and two pens. Amber-Lee is one of only 4 children to have 100% attendance at the Swop-Shop. Amber-Lee took Marquin and Raquel, and this little family, each with a bag of loot, trudged back home to either sleep or, hopefully, continue playing. This is Fabian, 8 years old, one of the 146 children who came to the Swop-Shop this week. When I picked him up for shopping, after he had check in and had his collected recyclables weighed, he had earned 8 Mula points to spend and no idea of what he wanted to trade for. 8 points is not very much. It would buy him a small colouring-in book, a packet of wax crayons and an eraser, a soft toy, or a piece of soap plus a roll of toilet paper. As he came without shoes and winter is just around the corner, we checked on the 2nd hand shoe bin, and luckily, a pair of sneakers fitted perfectly (we don’t get many 2nd hand shoes, let alone new ones, and there’s often little variety on offer, so it’s a matter of luck to find a matching pair of feet). He was happy with the shoes (2 points). Next, I suggested a new hand-knitted beanie, donated by one of the many volunteers who knit and sew for our children – he wasn’t convinced (a beanie is not much fun, for a young man). But I put the beanie on his head and showed it to him to the mirror, and he was surprised and very pleased with his image. (As with so many kids, they are amazed and thrilled with what they see, for many it seems to be the first time to look into a mirror.) So we had a beanie (2 pts). Next was a woolen jersey – back to the mirror, happy smile, thumbs up (another 2 pts). 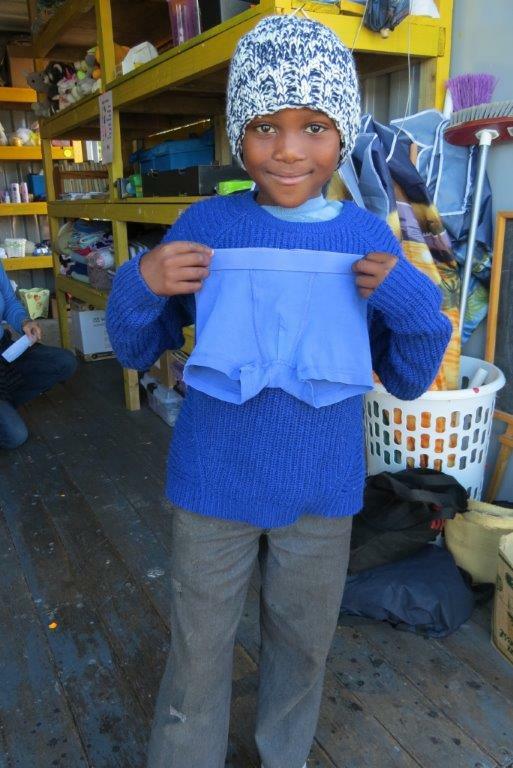 We completed the (almost) new, blue outfit with neat and clean underpants (underwear, too are not often donated, we need much more), and Fabian left not only happy, but well equipped for those cold winter mornings!! We offer good second hand clothing at very low ‘prices’ as we see it as a necessity and realise that it is not second hand, simply pre-loved! Behind this “chicken bravado” lies the gentle, caring spirit of Lindiwe Ngyenge, known as Emma’s mother in the local community. She is our gifted interpreter who can shed light on one-sided conversations with the little Xhosa children who nod at every question. Lindiwe is also one of our amazing “personal shoppers” who the children adore. Lindiwe’s response was :- “I think the SwopShop is like a healing garden of the soul for the soft hearts of the children. These children face many challenges at home, sometimes abuse and the parents have marital problems, many challenges which the children live with. For the time that they are at the SwopShop, they can get new strength to face these challenges and for the hour or so that they stay at the Shop, they can forget about their problems. You know, us parents, we don’t have time to read stories with our children. We come home late and we are tired. Also we cannot buy a lot of toys or clothes for them. But they come to SwopShop and there is story time, they play with toys and do crafts. That is why I say it is like a healing garden to the soul.